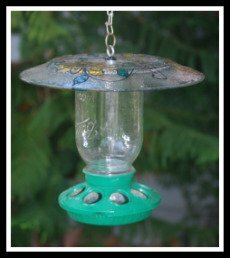 Birdfeeders are fun to have in your garden. They are very popular, but there are "So Many Types". They are almost as varied as the birds themselves. So, you ask, "Which one do I get"? It all depends on whether you want to attract certain birds or whether you have any other creatures around that might get into your feeders. 2.WindowBirdfeeder: Kids especially like this one because you can get a close-up view. 3.Tube Feeder: The size of the seed holes will dictate what seeds you use, therefore what birds you attract. Of course you can put a seed mix and attract all kinds of birds. If you have a problem with squirrels eating all your wild bird seed. Good Luck! I'm sure there are some that really work, but you are really missing out on some good laughs if you don't like the squirrels. I like to watch them do their trapeze acts while trying to get to the seeds. They get into some of the most precarious positions. This is usually a metal type cage. It holds a block of suet. Suet is fat that has been rendered and formed into a shape. Sometimes seeds are mixed in. Insect eating birds usually prefer the suet. This feeder does not cater to a specific bird. It is one of the messiest feeders because it has no trays, perches, or sides to speak of. I still like them though. I know it sounds a little complicated, but really it's not. There are the specialty birdfeeders, but then there are the, not so usual ones. These "unique"
feeders are not only functional, but are just "so darn cute"! The feeders that I have included on this page are from www.garden.com. These feeders hold a solution of sugar, water, and coloring. Humming Birds are attracted to the color red, so usually the feeder has splashes of red coloring on it. Make sure that you clean them often. All these types of feeders can be used with a variety of foods. It is just a matter of what you like. After all, it's your garden. You do what makes you happy and have fun! The wooden birdfeeder is the most popular, but with so many styles, colors, and materials on the market, don't just stop with one. My Shabby Chic birdfeeder is da' "bomb". The birds love it. 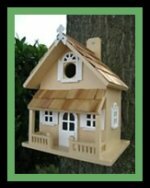 I have incorporated something old and something new and came up with a feeder that I know you are going to love. I used a high quality glass container, to hold the seed and a 9" clear plate for the top. 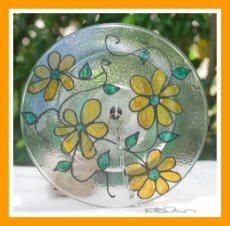 I have painted a beautiful design on the plate, using the highest quality stained glass paints. There are eight feeding stations, so there is plenty of food to go around. Next time your are outside relaxing and drinking your favorite beverage, you can now share your experience with your bird friends. 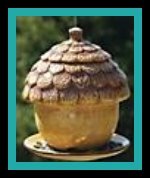 I normally make this feeder for my family and friends, but I have gotten so many requests for it, that now I am selling it in my Goodies eStore Page 4. But, if you would rather make it yourself..I'm going to share my Projects Page with you. The Tea Cup feeder is a nice gift for Mother's Day, a birthday, or just a fun treat for yourself. They also make a beautiful addition to your garden and make a bold statement when they are grouped together, in your flower bed, at different heights. This cute little feeder adds an "Awe" to your garden art collection. 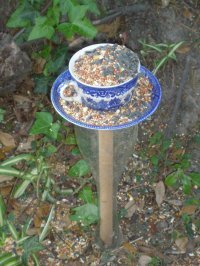 To see more of my "Shabby Chic" and my whimsical "Tea Cup" feeders, please visit the Goodies eStore: Page 4 Birdfeeders are a very important source of nutrition for our birds especially during the winter months. Everyone that comes to our home loves to watch the birds. Our friends children are fascinated by all the colors and songs. Being outside in my garden, feeding the birds, just gives me another excuse to relax. It's a pleasant way to pass the time. Drinking coffee outside in the mornings and watching the birds come by and enjoy their breakfast, this is a very soothing way to begin my day. If you didn't know, there is a "National Bird-Feeding Month", it is in February. The National Bird Feeding Society will send you information. Teachers, there are all types of educational activities to do with your students. If you would like more information go to www.birdfeeding.org. Now it's time for you to take a look at my photos and decide which birdfeeder you like best. Can't decide, then get a couple.. I won't mind..The more birdfeeders the better!